After 6 days in Kuwait, The Wife and I made the short 1-hour hop over to Doha, Qatar. We've flown through Doha numerous times on Qatar Airways, but I've only made 1 trip ever to the city (about 10 years ago now). At the time I reviewed the regular menu Veggie Burger and one of the Tuna Salad options, but since it was long before I started this blog I didn't take more than a single photo. 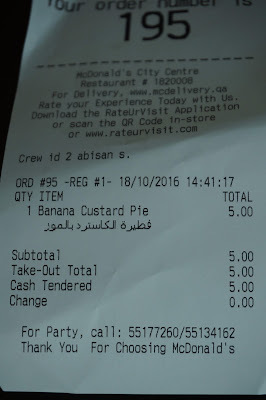 Since most of the Middle East shares the same menu, just as in Kuwait the week before McDonald's Qatar didn't have any new promo burgers to try either, but what they did have is a Banana Custard Pie which from what I could tell was only available in Qatar and not the rest of the region, so it's not a burger, but at least it was something worth trying! I took my first bite with a bit of hesitation, since my last Custard Pie in Oman was one of the worst Pies I've ever tried, and there was some strange dark "birth mark" on the side of the pie. The crust was the standard Fried Pie crust found everywhere nothing special there, but the custard cream inside was one of the better attempts at custard/cream I've had. It was sweet, but it wasn't sickeningly sweet. Bit Banana syrup wasn't the same bright yellow, Banana syrup I had in the Banana Pie in Asia (which happens to be sold in the Philippines right now. I actually just got back home from Manila last night, but I skipped it this time around). The dark brown banana filling was clearly made from real Bananas and although it didn't have any large chunks of banana, it had a mixed consistency, some parts were pretty much cream, but some were semi-firm where banana didn't get fully blended in. Although this probably would have worked even better as a Baked Pie, it was still one of the better fried pies I've had in recent memory. You can't really tell from the photos, but there was about 25% more custard than there was Banana filling, and I thought that was OK in the end as both fillings were tasty, but I would have liked a bit more of both. 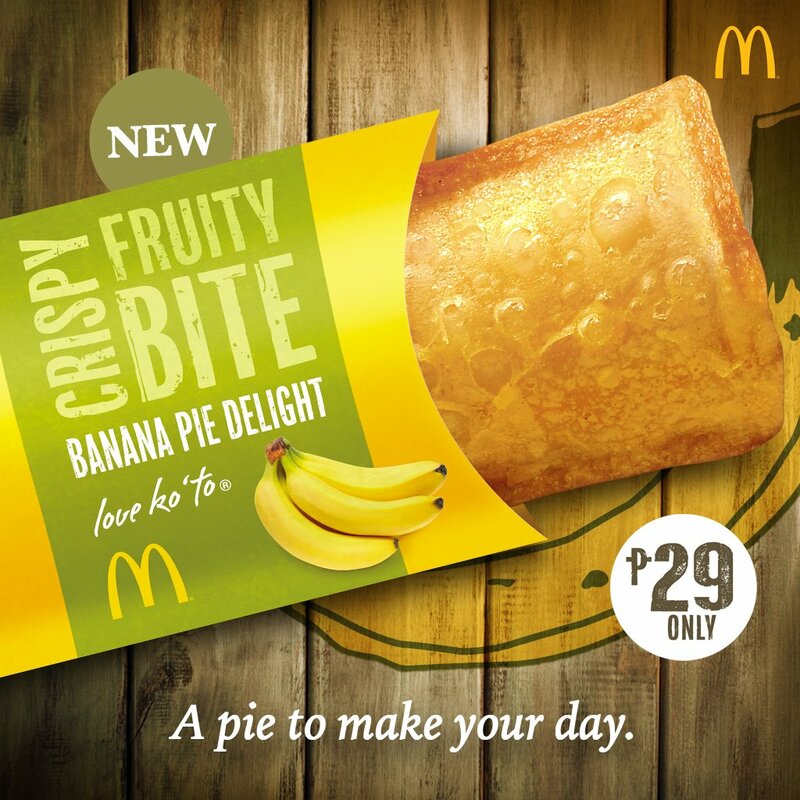 Not sure if it was because they used slightly higher quality fillings than a typical pie, but there was probably about 1/2 the amount of filling you'd expect to have in an McDonald's Pie. 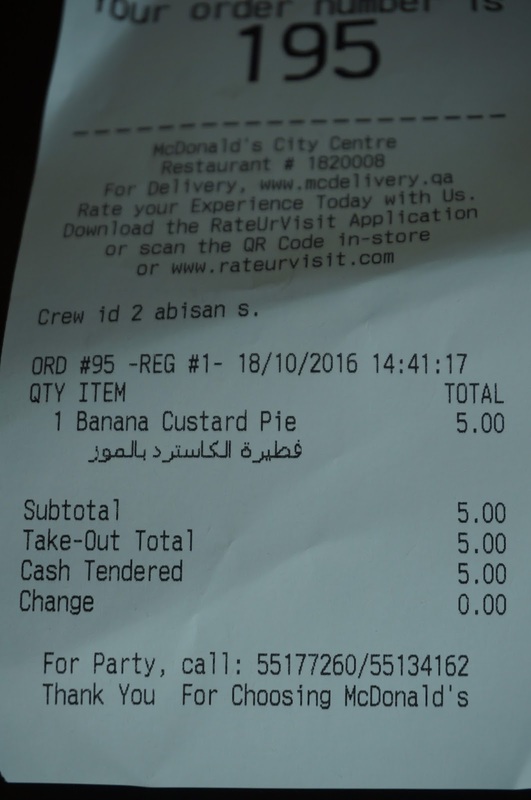 It's also the exact opposite from the Mango Custard Pie I had from the UAE just a couple weeks prior that had more mango than custard. Since I had just reviewed this Banana Custard Pie, I passed on the Banana Pie that was available in the Philippines on my last trip. It looked identical to the ones I've had in South East Asia, so I didn't feel it was worth trying.